Money is an imaginary store of value that was invented thousands of years ago to solve the double coincidence of wants problem inherent in barter. Users of money are required to believe that physical objects such as metal tokens and printed papers embody this imaginary store of value. These physical objects are provided with distinctive physical properties such as shape, composition, markings and weight, which enable users and machines to identify them. The physical properties function as a key to a lock. A vending machine dispenses a product when presented with a key, which can be a coin, banknote, bar code or signal from a mobile phone. A chiralkine system differs from a monetary (financial) system in that unlocking the performance of each step requires the use of two keys, one from each side of a relationship. Performance of each step changes the physical properties of the keys. Each physically changed key can be paired up with a physically changed key of another person to unlock the performance of the next step, which again changes the physical properties of the keys. The changing physical properties of the keys controls the performance of all of the steps as a cycle. The keys are physical things having distinctive physical properties that enable them to open a lock. The locks, like those in a conventional vending machine, can physically enclose a good being exchanged. The entire process of exchange can be handled using lockers and keys without users having to believe in imaginary stores of value. All of the locks and keys can be electronic. The locks can be in self-propelled driverless vehicles, such that the entire process of exchange: computation and physical delivery, can be automated. 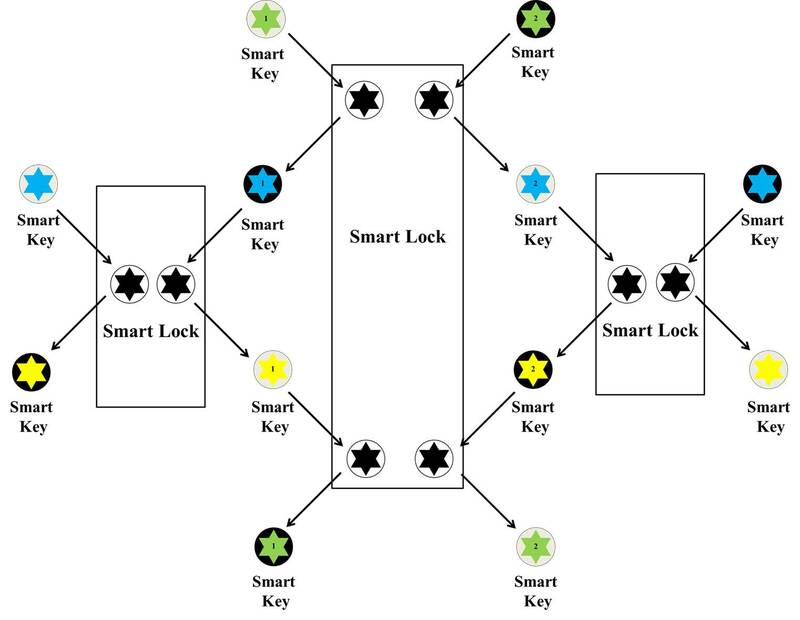 The drawing below summarises a concept for using smart locks with smart keys that change state when they interact with a smart lock. The smart keys labelled 1 and 2 are synchronized with the central smart lock such that they alone can interact with it. In effect the smart lock (which can be in two states: open and closed) and the smart keys (which can be in six states) are substrates for one another. Although different locks are shown above, one universal smart lock and one universal smart key (cell phone?) could be used to construct the system. If there is any electrical engineer out there interested in building a prototype, please get in touch! Because a chiralkine system enables exchange using two keys instead of one (an imaginary store of value), it can be used to conduct trade that is reciprocal and completely free. None of the keys can be used as an imaginary store of value to pay off a third party at a toll gate. The keys have no intrinsic value, so there is no point in taking them, legally or illegally.